Marsha Brook spent her youth learning wax modeling at her family’s jewelry casting company in New York. Brook studied fashion design and illustration in the 1960s, and since 1974 has developed her skills carving materials from foam to stone, focusing on modeling in wax and clay for casting in bronze. After receiving her Master’s in Science from Columbia University, Brook studied art from New York to Arizona, New Mexico to Los Angeles, and from Italy, France and Mexico, learning from the most accomplished fine arts teachers. Since her move to the San Diego area in 1998, Brook has created public and private commissions for clients on both East and West Coasts. 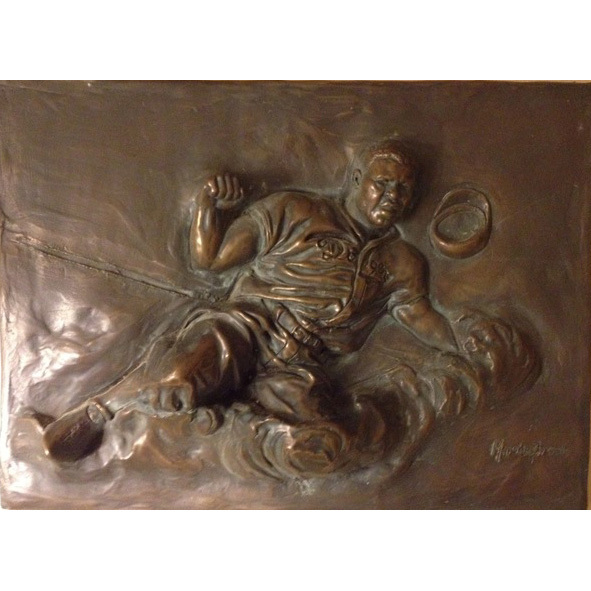 Her life-sized bas relief of Jackie Robinson is on display at the YMCA in San Diego; her life-sized super hero hangs in a dental office in Vista. Many of her private commissioned sculptures of figures are in collector’s homes in Rancho Santa Fe, New York’s Park Avenue and Florida. Notable public artworks include: a three-quarter life-sized bronze entitled “Friends of the Library” in Fallbrook, CA, a larger-than-life Greyhound dog erected as a “Milestone” to veterinarians in Alameda, California, and at Scripps Green Cancer Center, a reclining female entitled “Awareness” inspires attention to the cause. Brook has exhibited at the San Diego Museum of Art in Balboa Park. Her bas-relief portrait of Elie Wiesel was shown at National Sculpture Society in New York for the “World Leaders Exhibition”. Among the completed portraits by the artist are: Paul Robeson, Elie Wiesel, Martin Luther King, Maya Angelou, James Earl Jones, Benjamin Vereen, Beatrice Wood, Jackie Robinson, James Baldwin and Shirley Chisholm, with works in process of Marion Wright Edelman, Harry Belafonte, Rev. Adam Clayton Powell, Rev. Ralph Abernathy, Andrew Young, Mahalia Jackson, and Rosa Parks.